Retro Studios, the Austin, Texas based development team responsible for making three Metroid Prime games for Nintendo—and one Metroid Prime compilation—may be ready to reveal its new project, a game reportedly starring Donkey Kong. 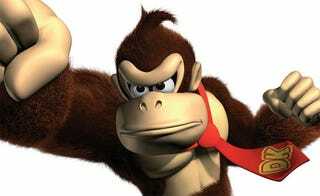 IGN reports that it has heard "credible" talk about Retro Studios creating a Donkey Kong title for the Wii, which, one could argue, could be something of a revival of sorts for the character. Donkey Kong's most recent console games, the drum controlled GameCube titles Donkey Konga and Donkey Kong: Jungle Beat—later ported to Wii—were very different from the successful Donkey Kong Country platformer games of the SNES. Last time we spoke with Retro Studios, it said it was well into development on its next title and hoped to show it off some time this year. That's about on schedule for Retro, whose last original game was released in 2007. Nintendo's E3 2010 press event kicks off Tuesday, June 15 at 9 a.m. Pacific. We'll probably know by then if DK is back as a leading simian.